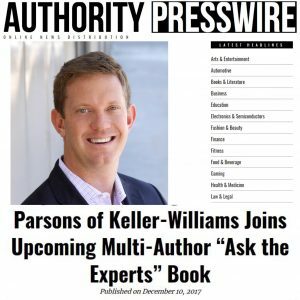 Our very own Brian Parsons is being featured in the new book, Ask The Experts, The Unique Benefits of working with Top Professionals!! Brian has worked in real estate since 2006 and rapidly gained traction in the Pasadena and the Greater Los Angeles area. With extensive knowledge in the area and a strong work ethic Brian quickly became one of the top-producing agents. In Brian’s excerpt from the book, he discusses topics such as; choosing the correct agent for your needs. Further addressing questions such as; should you hire a family friend or a referral, how important is a team versus an independent agent and what will the marketing look like in our transaction. A second generation realtor, Brian gained comprehensive insight of the industry and market. Positioning himself in the field with a team of seven, The Parsons Real Estate team has helped hundreds of residential homeowners find the perfect buyer, navigating the escrow process and ease the stress of working with several vendors. Brian’s book Ask The Expert, The Unique Benefits of working with Top Professionals, can now be purchased on Amazon . Brian has always placed value on meeting his clients needs and is eager to share his knowledge with you. Please join Brian for his Official Book Release Party on Thursday, January 25th, 2018. Each guest will get the unique opportunity to get their book signed, take part in a fun and informative Q&A with the Authors and enjoy an evening with forward thinkers. Please join us on Facebook and Instagram for additional information!